It is often said that your photographs are the single most important investment of your wedding day. After all, once the reception is over and your guests have gone home, all you really have left are your memories – and your photographs. Images created by a professional wedding photographer will help to keep those precious memories alive, and last a lifetime. Aluminium Standard includes 5 hours’ coverage and a minimum of 200 images supplied on disc. All images are individually edited for colour balance and density and supplied as high quality JPEG files. A licence allowing unlimited personal use of the images is also included. Aluminium Plus includes 8 hours’ coverage and a minimum of 300 images, individually edited for colour balance and density. They are supplied as high quality JPEG files on a luxury jewelled USB Memory Heart in a velvet pouch and presentation box. A licence allowing unlimited personal use of the images is also included. Platinum services include photography from the bride getting ready right up to the start of the wedding breakfast at the reception. They include a beautiful wedding album containing between 50 and 100 images on individually designed storybook-style pages, together with the images on disc and a licence for unlimited personal use. Bronze album packages offer excellent value for the smaller wedding or those on a budget. They include coverage of the ceremony and reception up to the start of the wedding breakfast, and an album containing 30 8″x8″ prints. Silver packages offer a more complete record of your special day. They include coverage of the bride getting ready, the ceremony itself and the reception up to the start of the wedding breakfast. The albums include between 60 and 75 images, and can feature multiple images on a single page. Print size is 8″x8″. Gold album packages also include coverage of the bride getting ready, the ceremony itself and the reception up to the start of the wedding breakfast. They feature a larger size album (holding prints up to 11″x11″) with individually designed pages which allow for the greatest creativity in the page layout, and contain between 75 and 125 images. Please see here for details of very affordable wedding photography packages. These are extremely limited in number, and are only available on a first come, first served basis. An initial face to face consultation with you to discuss the style of wedding photography you prefer, as well as any particular requests that you have (eg for group photographs). On the day of the wedding itself, I take an unlimited number of photographs within the time available. All photography is carried out by me personally – not someone hired by me who you may never have met before. With my experience of hundreds of weddings, I am familiar with most wedding locations in Chesterfield and Derbyshire, and how to use them to best advantage. This local knowledge and experience can be invaluable in the event of bad weather or unforeseen events. My photography of the wedding day usually starts as the bride is getting ready. You can see more details of my coverage before the wedding ceremony here. I continue taking photographs at the ceremony itself, of course, and finish at the reception after the start of the wedding breakfast (and a mock cutting of the cake). If requested, photographs can also be taken at an additional location (such as a local park or beauty spot in Derbyshire) at no extra charge. Full coverage of the whole day is available as an option with all services. Your wedding proofs are normally ready within two weeks of the wedding day. When you have selected your favourite images, you can either leave the design of your wedding album entirely to me, or become involved in its layout and design yourselves. 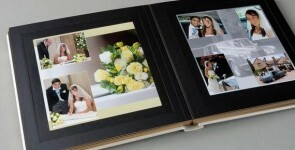 You are never restricted to a single size of photograph in your wedding album. You can also choose to have them in black and white, sepia, or with a range of special effects applied. All prints are made on genuine photographic paper (which has a lifetime guarantee). All picture editing and album page design is carried out personally by me, using high-end professional hardware and software. I am an experienced user of Adobe Photoshop, and also offer training in its use. Chris James Photography is insured for public liability and professional indemnity (for your peace of mind, though never yet needed).